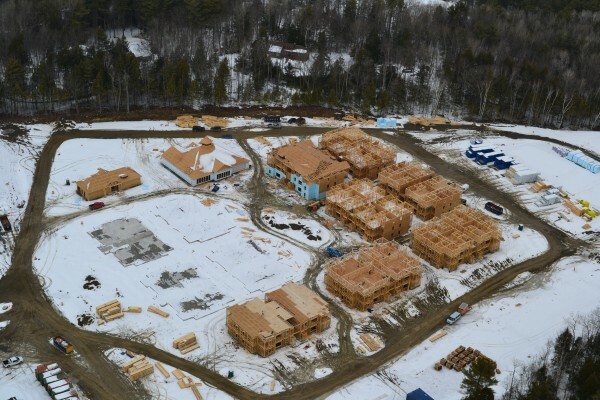 Pictured is an aerial view of the construction of The Grove, a student-housing complex in Orono built in 2012. College communities often navigate a tenuous balance between welcoming students and loathing them, and residents of college town neighborhoods experience this tension most acutely. In Orono, home to the University of Maine, the tension is heightened by disturbing demographic numbers. For one, the town’s population of families is declining faster than in Bangor and Penobscot County as a whole. Orono had a 17 percent decline in families with children under 18 living in town between 2000 and 2010, according to U.S. Census data. Bangor saw an 8.5 percent drop while the number of such families grew 5 percent in Hampden and 15 percent in Bradley. This primarily is because families who move out of town are not being replaced by new families moving into town. There could be a variety of factors contributing to this decline, such as Orono’s high tax rate, school choices or the preponderance of students in town, Town Planner Evan Richert said. Orono has more rental units than any other type of housing unit, with nearly half occupied by students and 700 of them in residential neighborhoods. Add to that the oft-heard complaints about student housing encroaching on neighborhoods, and town officials have decided to consider ways to restore a better housing balance through new rules about homes occupied by students in residential neighborhoods. This is reasonable, but town officials and residents must ensure Orono — which Richert defines as a “mediocre” college town — doesn’t further alienate the university population that is the town’s life blood. A fairly recent trend has parents buying a single-family home for their college student son or daughter and his or her friends. With rent paid by the friends, this arrangement can be cheaper than paying campus housing fees and/or rent for an apartment off campus. This especially can make financial sense if a family has more than one child who will attend UMaine. Unlike former homes chopped up into apartments, these student homes are in established neighborhoods likely to be home to families. Orono is considering new rules for student homes. Under the rules being considered, “student homes” would be a new class of land use, which could then be regulated. By requiring a separation between student homes, for example, residences would be dispersed throughout town rather than being clustered in several neighborhoods. Other college communities, such as in Poughkeepsie, New York, which is home to Vassar and Marist colleges, have similar restrictions. A public hearing on this proposal will be held Oct. 20. It isn’t just a matter of where students live: Orono has work to do to become a true college town, which could offer it a substantial economic advantage. Some of this may be a bit hyperbolic — as the university brings thousands of people to campus each week for events, concerts, sporting events and for its recreation center — but perception matters. Another interesting finding was that faculty, staff and students who live in Orono view the town more favorably than those who don’t, which speaks to the town’s loss of family residents. New restaurants, bars and a recent bus route between campus and downtown are making Orono more appealing. Town and campus officials can’t move UMaine closer to downtown, but they can help make the community more attractive to university personnel, whether they be staff, students or faculty, regardless of where they live.